Robber coverage has been a staple in defensive coverages from high school all the way to the pro levels. We’re going to go through all the different variations and mindsets behind the robber coverage. But first, what is robber coverage? 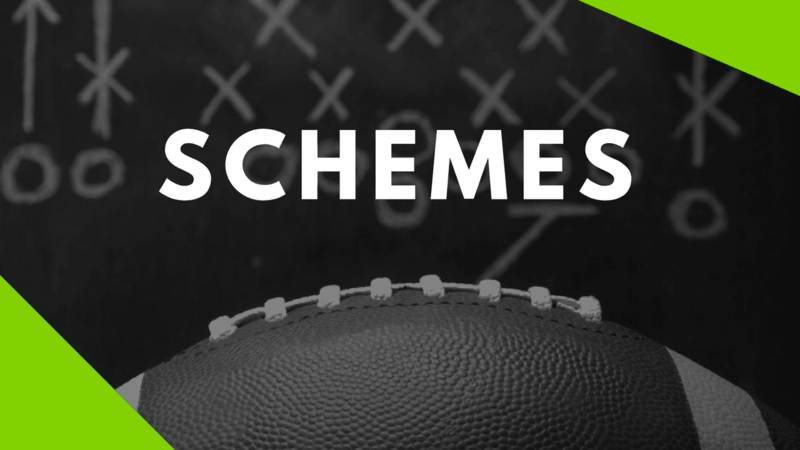 Robber coverage, or trap coverage as it’s often referred to, is a defensive coverage which baits the quarterback into thinking a receiver is open, only to trap the receiver and rob the quarterback for an interception. As offenses continue to evolve through the RPO, Pin and Pull, as well as all the spread concepts, defenses need to come up with ways to trick quarterbacks into thinking a receiver is open, when indeed he is not. We’re going to refer to it as robber coverage throughout this article. It’s always good to keep an open mind, as coaches may use different terminologies in their schemes. 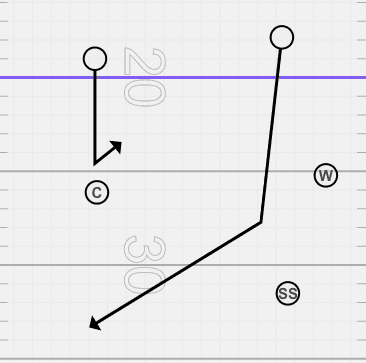 One of the most simplistic forms of robber (palms) coverage is from the corner positon. Let’s break down the diagram above! The player with the most impact on this play is the corner and the safety. Let’s start with the corner. Those are the base rules, as the corner is trying to rob any ball to the flat. To fully understand the concept, we need to understand how the safety plays into the coverage as well. We’ve drawn two different scenarios in the picture above. One with the receiver breaking inwards, and one with the receiver breaking out. 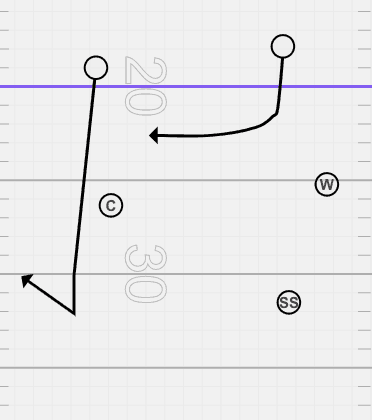 Test yourself on what the corner will do on each play. This coverage is often run with corners and safeties, who are quick with both their eyes and feet. Corners who take too long to read or safeties who get caught flat footed, could get beat over the top by the outside vertical. If you’re installing robber coverage, we highly recommend classroom time to understand ways to beat it. If you’re not sure of how to beat robber coverage, we’ve gathered the most popular combinations to get you started. As always, we like to teach concepts from both the defensive and offensive side of the football. If you and your players understand how coverages are beat, it gives them a better understanding of how offenses are trying to manipulate them. With this combination, we’re occupying the corner with the out-route (baiting him to come up and anticipate a throw from the quarterback). Once the corner vacates the area, we then want to sneak a comeback about 8-10 yards behind the corner. Safeties who are reading the #2 receiver, will have to get all the way over to the #1 receiver which is tough to cover with an accurate throw. This combination can prove useful to quarterbacks with strong arms. Quarterback’s with weaker arms, this may be a combination you try to throw into the boundary. 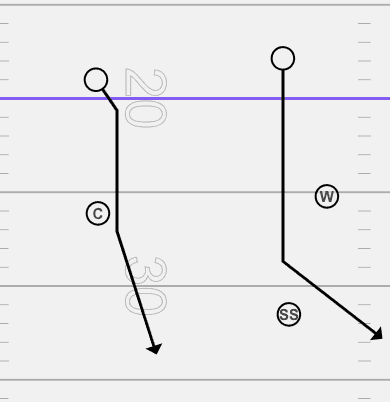 The double post concept is for teams that can stretch the field vertically, or have a slot receiver that can draw some attention. A few things need to happen for this play to be successful. Another technique is to stem up the corner, break his hips out, then break back to the middle of the field for a clean footrace on the skinny post. The smash concept is one of the beginner concepts in every spread system, and for a good reason. It’s an easy high-low read for the quarterback. If the corner sits on the hitch, throw the corner. If he bails on the corner, throw the hitch. Super simple. What is your favorite passing combination to beat palms coverage? Let us know in the comments below! Robber coverage is a coverage that can help you steal an interception from a quarterback who thinks a receiver is open when he’s really not. Each coach may have his different variations of robber coverage ( especially from the corner or safety position). The one we listed is the most basic and can be implemented against 2×2 or even 2×1 sets to counter teams who love the bubble/flat game. Do you teach palms/robber coverage differently? How many variations of it do you have in your offense? Let us know in the comment section below!